Part of the appeal of a membership at Diamondback Golf Club is the community you’ll get to be a part of, and the great relationships you form. The Woodland Valley community at Diamondback Golf Club feels like you’re moving in with family! Located off Highway 9, you will be far enough away from the hustle and bustle of the city, but only 20 minutes away from the sandy beaches of the Grand Strand. The Woodland Valley community is a golf fan’s dream. Located a few steps from Diamondback Golf Club, you will have access to a great golf course with great practice facilities and members. If that’s not enough for the major golf enthusiasts, some of the homes sit along the lake and overlook the championship golf course. Almost every house will have a view of the lakes or the golf course. If you or your family are not into golf, no worries! The Woodland Valley Community is located only 20 to 30 minutes away from the sandy beaches, great shops, live entertainment, and more than 1,600 restaurants! No matter what you’re into, the Woodland Valley Community has everything you could ever want within a short drive of the entrance. 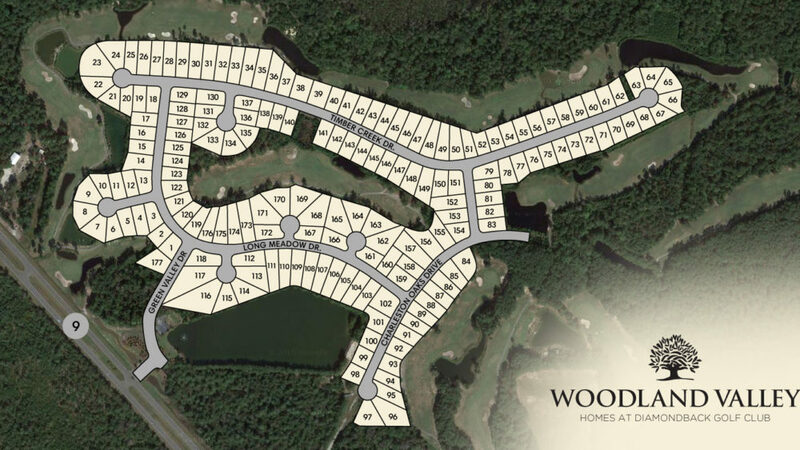 The Woodland Valley Community offers a wide array of different home options. Starting in the $170’s, Woodland Valley offers custom floor plans ranging from 1,400 to 3,000 square feet. You, as the consumer, can choose between a 3-bedroom, 2-bath home or 4-bedroom, 3-bath home. Each newly built home has all of the upgrades a homeowner would want. From granite counter tops, Energy Star appliances and much more, your home will be ready to meet all of your needs. The Woodland Valley Community offers something for everybody. Golf, shopping, and restaurants are a short drive away! To learn more about the community itself click here or call 410-377-8505! Already live in Woodland Valley and want to be a member at Diamondback? Give us a call at 843-756-3264 or come see us in the shop!